Everything is big in Texas, except for in this case, the biggest thing is the idea! Brad Kittel was recently featured in the Austin American Statesmen as the man behind Tiny Texas Houses. This innovative company constructs prefab homes ranging from 100-500 square feet. Based out of Luling, TX, Tiny Texas Houses joins the ranks of similar pint-sized, specialty builders like California’s Tumbleweed Tiny House and Iowa’s Small House Society. 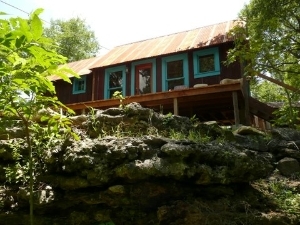 Kittel’s homes range from $40,000- $90,000 and are composed of salvaged materials. He was inspired to use vintage materials when he spent time rehabbing homes in Austin’s French Place neighborhood. The simplicity and resourcefulness of the homes are impressive. They are easily modifiable, they have customizable kitchens/bathrooms, they reuse durable old wood that is resistant to termites, and they are energy efficient. In a slower economy and a time when “green” is the hot button issue, an idea like Tiny Texas Houses may be the beginning of a new housing revolution. Keep your eye on Kittel!